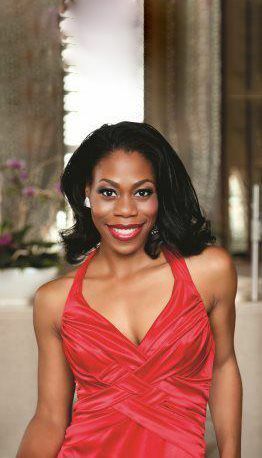 Mezzo-Soprano Opera Singer Chrystal E. Williams - Alpha Artists Management, LLC. Mezzo-soprano Chrystal E. Williams has been described by leading critics as “strong and so assured”, “lithely negotiating the coloratura demands before descending into a robust low register”, and “poised, polished, in complete command of the vocal calisthenics”. Recent and upcoming: Last season included Charlotte in Werther with Baltimore Concert Opera and OperaDelaware; Pearl/Mary O'Fallen in Ricky Ian Gordon's Morning Star; On-Site Opera; soloist in Verdi's Messa da Requiem with Lancaster Symphony; concerts with Annapolis Opera and a return to Northern Lights Festival as Rosina. In the 2018-19 season she revisited the role of Rebecca Parker in YARDBIRD with both Atlanta Opera and Arizona Opera; and returned to Birmingham Opera Company UK for a role debut as Katerina in Lady Macbeth of Mtsensk. In addition, she sang the Beethoven Symphony No. 9 under the direction of Simon Rattle with the City of Birmingham Symphony Orchestra. Next season Ms Williams makes a number of debuts which include the Metropolitan Opera as Maketaten in Philip Glass's Akhanten, The Stewardess in Jonathan Dove's Flight and a reprise of Rebecca Parker with Seattle Opera. Ms. Williams sang the role of Publia and covered the role of Arsace in Rossini’s Aureliano in Palmira at Caramoor in 2016; Michael Tippett’s, A Child of Our Time with Boston Modern Orchestra Projects (Harvard Choruses); a Beethoven Symphony No. 9 with the Springfield Symphony; Bach’s Magnificat with the New Jersey MasterChorale; Nach Dir, Herr, verlanget mich, BWV 150, with The Philadelphia Orchestra, Yannick Nézet-Séguin conducting; soloist with the Lancaster Symphony in Mozart’s Requiem; soloist with OperaDelaware in their presentation of Rossini’s Petite Messe Solennelle; revisited her role as Rebecca in Charlie Parker’s YARDBIRD in a co-production with Hackney Empire and English National Opera; and, sang Olga in Eugene Onegin with Northern Lights Festival for the summer of 2017. Ms. Williams has been heard in concerts with the Norrköping Symphony Orchestra in Sweden; debuted with Washington National Opera as Elizabeth Keckley/Coretta Scott King in Philip Glass’s Appomattox; was reëngaged with Birmingham Opera Company (UK) as Dido in Dido and Aeneas; presented in recital with Portsmouth Community Concerts; was a guest soloist in Rossini’s Petite Messe Solennelle with Smith College; reprised Rebecca in Charlie Parker’s YARDBIRD at the Apollo Theater under the auspices of Opera Philadelphia; and, sang a role debut as Hänsel in Hänsel und Gretel with Knoxville Opera. Additional assignments have included: a cover with Gotham Chamber Opera of Cat in El Gato con Botas; a debut with Opera Philadelphia as Rebecca Parker in a new commission by Daniel Schnyder, Charlie Parker's YARDBIRD; a Birmingham Opera Company (UK) debut as Hannah in Michael Tippett’s The Ice Break, Graham Vick, directing; a Verdi Requiem with New Jersey MasterChorale; concerts with the Cairo Symphony Orchestra in Egypt and a debut with Pine Mountain Music Festival as Rosina in Il barbiere di Siviglia. She created the role of Yvette in the world première of Eric Sawyer’s The Garden of Martyrs; performed the role of Dulcinée in Massenet’s Don Quichotte; Olga in Tchaikovsky’s Eugene Onegin; and sang Linda in Kurt Weill’s Lost in the Stars in a debut with the Glimmerglass Festival. She made her Sarasota Opera debut as Rosina in Il barbiere di Siviglia and was a featured soloist in Elgar’s Sea Pictures with the Philadelphia Youth Orchestra; the Verdi Requiem with the University of Pennsylvania Symphony Orchestra; and Rossini’s Stabat Mater with the New Jersey MasterChorale. Ms. Williams has been honored by the Wilhelm Stenhammar International Music Competition and as Audience Favorite; the International Belvedere Singing Competition; the Giulio Gari International Music Competition; the Mario Lanza Competition; the New England Region Finals of the Metropolitan Opera National Council Auditions; the Liederkranz Foundation and the Giargiari Bel Canto Competition. The Chrystal E. Williams Scholarship was founded by the artist in 2004 to help students wishing to pursue a career in the Performing Arts. This scholarship is funded in part by her concert, An Evening with Chrystal E. held annually during the month of June in Norfolk, VA. Ms Williams is a graduate of the Academy of Vocal Arts in Philadelphia, PA where she earned her Artist Diploma in Opera Performance. She received her Master of Music in Opera Performance from Yale University School of Music in 2010, and her Bachelor of Fine Arts in Voice Performance from Carnegie Mellon University in 2008. “…the timbre of her voice has an energy and brightness that carried her easily through the coloratura fanfare of ‘Una voce poco fa’, and everything else Rossini tossed in her path. That made her a spitfire Rosina with a twinkle in her eyes and the kind of sparkle her suitor, Count Almaviva…would pursue to the ends of Andalusia."